Do you remember this? Several months ago, the front forks on my fixie started buckling in a most alarming fashion. Long-time readers may also remember this, from several years earlier – another alarming fixie fork failure. Well, the most recent problem was with the forks that got replaced less then three years before, so they were still under warranty. So I contacted both Salsa and the local distributor confident of speedy resolution. This was in May. Finally, in mid August, I get the bike back on the road. Three whole months. Why did it take this long? I have no idea. A catalogue of problems, phone calls, parts not arriving, alleged computer problems, alleged shipment problems, warranty issues; the list of excuses was legion. I was, as you might expect, extremely unimpressed. Apparently replacement Salsa forks are no longer available, so Salsa replaced them with a Surly set. To be honest, I’m rather pleased about this; my faith in Salsa forks is now irrevocably damaged. 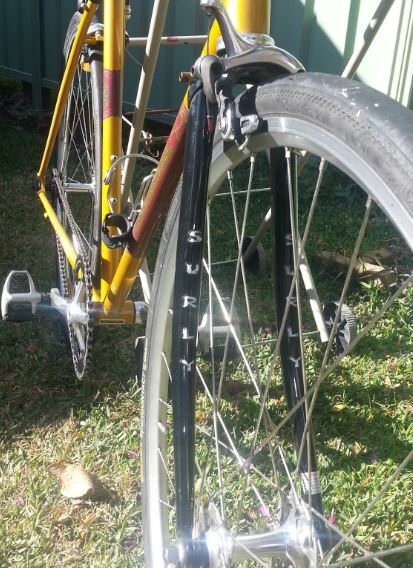 The local Salsa agent informed me that Salsa had authorised a ‘$120 credit note’ to obtain the new forks. Gallingly, I see that Wiggle has Salsa forks in stock, with free 3-day shipment to Australia. For $103. If Salsa had just given me the $120, I could have had the bike back on the road inside a week, with seventeen dollars to put towards the installation cost. But, as it was, I had to wait three months to get my bike back on the road, with no contribution to put towards the labour charges. Three months! And an interesting three months it was; half of it was spent riding a loan bike from the shop (the very helpful Cranks in Chatswood). This was brought to an abrupt end, however. The rest was spent riding Mrs Dan’s electric Gazelle, which was also interesting, and something I will write about at some point, if I remember. However, in the meantime I’m just glad to be back on the fixie. I was wondering if I’d have forgotten how to ride it, after three months with the pernicious temptation of a freewheel, and more latterly, a motor. But all was well; much like riding an, erm, bicycle, you don’t forget. So much more fun. I love my fixie. But my love affair with Salsa is well and truly over. I still enjoy riding my Casseroll. But three forks and some appalling customer service later, I somehow can’t see me recommending Salsa to anyone else any longer. Ride and… Sigh, everyone, Ride and Sigh. This was a cheap purchase for my kindle that I bought before a plane journey, along with some other books. I bought it without really looking to see what it was about, except that it seemed to have mostly good reviews, and was going for a song on the ‘daily deal’. Unfortunately, I didn’t really enjoy it. It’s a gawky, two-dimensional romance based on the could-have-been-intriguing-but-actually-rather-clunky premise of waking up from an accident in a world at once very familiar but also changed. The revealing of that plot device happens early on in the novel, and is probably the best bit. After that, it all goes downhill rather quickly, with stodgy prose and unsympathetic characters. I suppose you could try and analyse this book as some sort of exploration of the pragmatic reality of our life choices set against the unfulfilled dreams we set aside, but that’s a bit of a stretch (rather like arguing a Mills and Boon romance is some sort of commentary on the passions of the human condition). Unfortunately the ending is very disappointing, and of the ‘and then I woke up’ variety. Hey ho. 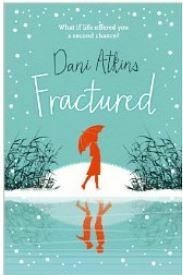 Clearly a lot of people have enjoyed this book, and that’s fantastic for them and for Dani Atkins. It just didn’t do anything for me.